Brazil is famous for its pão de queijo--cheese rolls with soft chewy centers. These traditional snacks and breakfast treats come from the state of Minas Gerias in southeastern Brazil. 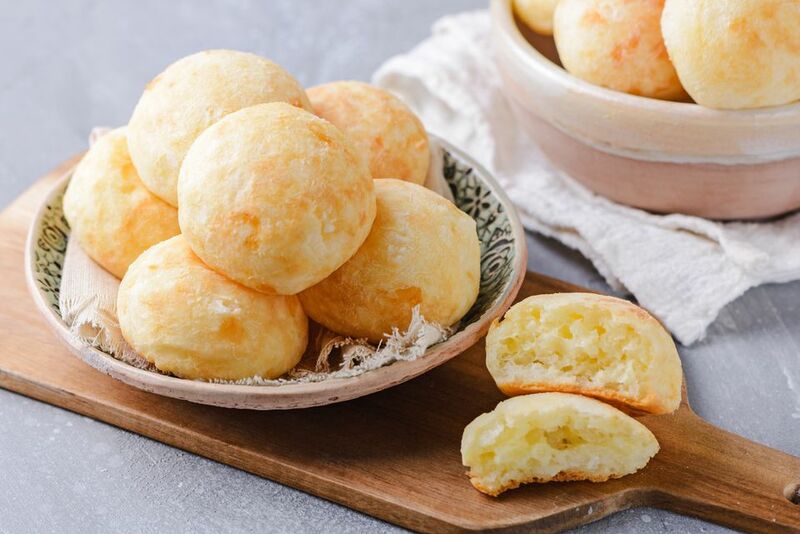 Although pão de queijo didn't become popular until the 1950s, they are said to have been around since the 18th century; the original version, however, did not include cheese or milk as those ingredients weren't available at that time. Pão de queijo is made with cassava flour (tapioca flour), the ground root of the manioc plant. Like many other Brazilian foods, this cheese bread originated with African slaves, who would first soak and peel the cassava root before making the bread. Pão de queijo smell wonderful when they are baking, and plump up into perfectly round balls. This recipe calls for regular farmer's cheese but if you can find the Brazilian cheese queijo minas in your local Brazilian market, your pão de queijo will be even more authentic. Otherwise, any firm, fresh cow's milk cheese will work well in this recipe. Mix milk, salt, vegetable oil, and butter in a pot, and bring to a boil. As soon as it boils, remove from heat. Stir tapioca flour into the milk and butter mixture. Stir in the eggs and the cheese, and mix well. Let mixture cool for 15 to 30 minutes so that it will be easier to handle. (You can chill it in the refrigerator for 15 minutes or so). With floured (tapioca flour) hands, shape the dough into golf ball-size balls and place them on a baking sheet. Bake rolls for 20 to 25 minutes, until they are puffed up and golden. They will rise slowly and puff up mostly in the last 5 or 10 minutes.